Journal of Tropical Ecology publishes papers in the important and now established field of the ecology of tropical regions, either arising from original research (experimental or descriptive) or forming significant reviews. 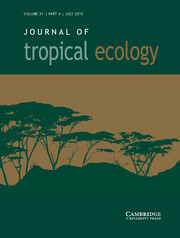 First published in 1985, Journal of Tropical Ecology has become a major international ecological journal. With clear, stimulating and readable reports of recent research findings, the journal provides a platform for the dissemination of information on all aspects of tropical communities and ecosystems. Does the presence of elephant dung create hotspots of growth for existing seedlings?